10 Years - and my sincere #gratitude! Something pretty magnificent took place on July 14, 2017. Thank you to Ryan Hampton's #VOICESPROJECT for featuring me on my 10 year anniversary. I celebrated 10 years aka ONE DECADE (!) of continuous sobriety/long-term recovery. Truly hard to believe. My life has gone in many directions since that fateful New York City hospitalization late the night of July 13, 2007. In some ways, I wouldn't wish my experience on anyone else - because I was in pain and hiding behind shame and not to mention the fact that I was destroying my insides and outsides with binge drinking. Even though it was over the moon fun at times - a wild roller-coaster of parties and life whooshing like a metaphorical convertible with the top down on a wide open highway - it was getting dark and fast. They say it's a progressive disease - alcoholism and all its relatives: at risk drinking, binge drinking, etc. If I hadn't chosen the path of sobriety when I did, who knows how bad it could have gotten. I, for one, am glad I didn't have to find out. Sometimes I wish the whole world had a program of recovery - whatever that program may be - because it gives them a moral code for living and improving their own and others' lives. It allows for service to others; it makes us grow as individuals. Besides the fact that it's HEALTHY to not poison our bodies and minds and souls and spirits with toxins. Every year I go to a candlelight 12-step meeting to celebrate my anniversary - the men and women in the room never judge me for only showing up once a year (editor's note: I'm the one who judges myself most harshly. Wait. I don't need an editor's note. I'm the writer *and* the editor. Giggle) Because remember - the only requirement for membership to Alcoholics Anonymous is a desire to stop drinking. You can be a member of however many or few programs as you want - you are the boss of your own recovery and there's power in owning your own path. Please believe me - and know that it's taken me years (ten, to be exact) to get to where I am today. ^ Here I am with one my closest friends in recovery, Amy. She and I met one year ago at Tom Coderre's [this guy is kind of a big deal in the recovery policy/advocacy world] summer recovery BBQ and she's become my SOUL SISTER since. 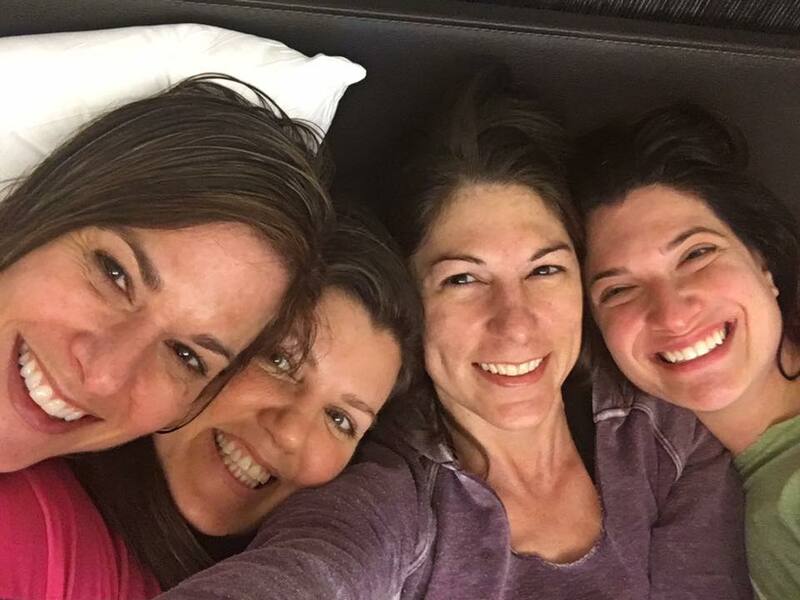 In May, we traveled to New York together for She Recovers in NYC and met up with two of our other sober sisters, Nona and Robin. (See below images: left image L to R: Robin, Nona, Amy, me; right image L to R: Amy, me, Robin, Nona). If not for being in recovery and wanting to give back to others and improve my own journey and connect with other creative spirits - I wouldn't have started The Sobriety Collective in April of 2015. This collective? It's for you. And for me. But it's about YOU, about US. I want your suggestions and feedback -- what would you like to see this coming year? There are plenty of exciting updates coming your way soon but for now, my greatest joy is to share others' journeys with you in the sporadicly updated RePro section. Writers, artists, entrepreneurs, musicians, athletes, advocates, filmmakers and photographers - these are the people whose recovery (from addiction and mental illness) I'll be sharing with you. Lastly, I want to give my thanks to all of you who contributed to my GoFundMe campaign when I was at a recent financial low. Money sobriety is something I'm still struggling with - and I didn't realize the cost of this undertaking until it bit me squarely in the rear. With your help, I was able to sock a bit away and pay for a full year of web-hosting. If you still want to donate, I'm not going to say no. But I just wanted to extend my most sincere gratitude to all of you.